This study is part of a comprehensive process in the City of New Bern, North Carolina aimed at drafting a subdivision regulatory framework that promotes sustainable residential developments with a heightened sense of community and vitality. The aim is to develop an objective assessment tool for new subdivision plans. Issues considered in this assessment include intra-and-inter-neighborhood connectivity, walkways, open spaces, the environment, and home architecture. The study highlights the transition from the traditional, open-grid street network and porch-fitted homes to modern suburbs with disconnected streets and garage-dominated homes. It draws on five planning and design criteria (accessibility, walkability, community, sustainability, and variety) to develop a performance-based rating system for development proposals. The rating system allows planners and architects to assign points and identify failings and changes required to encourage the development of well-planned residential subdivisions that complement the small-town appeal of traditional American urban centers. A unique sense of small town urbanity is one of the most desirable aspects of life in New Bern, North Carolina. The city (City of New Bern, http://www.newbern-nc.org), Swiss Bear (http://www.swissbear.org), the historic preservation commission, and other organizations have worked long and hard to protect New Bern’s charm and character (New Bern Historical Society, http://www.newbernhistorical.org). The aim has not been to create a repository for historic architectural styles, but to encourage the development of a livable city that maintains its past and integrates new developments. Like other US cities, New Bern has its share of new suburban developments that depart radically from their traditional counterparts. The latter are more car-oriented, and many lack the small-town charm and architectural refinements typical of traditional neighborhoods. This study is part of a comprehensive process aimed at drafting a subdivision regulatory framework that not only thwarts poorly planned developments, but also encourages well-planned ones with a sense of sociability and physical quality that complements New Bern’s small-town appeal. The objective of this process is not to propose ‘True Urbanism’ popularized by Jacobs (1961), Alexander (1977), Krier (1979), Carmona et al. (2003), Carmona and Tiesdell (2007) or the international making cities livable conference (Crowhurst and Crowhurst 1995; IMCL 46th 2008). The study certainly benefits from the extensive literature associated with these prolific urbanists and other popular planning movements such as the ‘urban villages’ (Aldous 1992; Neal 2003) and the ‘new urbanism’ (Katz 1994; Duany and Plater-Zyberk 1991, 2000). However, this study approach to developing better suburbs is primarily configured as an adjunct to existing Euclidean zoning context typical of most American towns. Extended discussions with various community groups and conversations with New Bern residents indicated that a mixed-use or transit-oriented development proposal for New Bern suburbs would be an exercise in futility; it would only add up to the list of previous studies shelved in the city’s archives with little or no hope for implementation. Hence, the pragmatic focus on the planning and design elements that can be implemented and would improve development practices in the city. The paper is mainly divided into three parts. The first part provides a historical context for American urban development and alludes to the forces that transpired a major shift in the American town from the mixed-use compact urban grid to the sprawled curvilinear suburbs that were exclusively zoned in separate residential, commercial, office, and industrial enclaves. The second part contrasts two clusters of New Bern neighborhoods; one cluster incorporates three traditional districts with homes primarily built before the 1940s; the other cluster incorporates two constellations of newer subdivisions built in the 1980s and beyond. The purpose is to highlight the transition from the traditional open-grid street layout and porch-fitted homes typical of traditional neighborhoods to the modern suburb with closed curvilinear street networks and garage-dominated homes. The third part of the paper outlines the five planning and design criteria (accessibility, walkability, community, sustainability, and variety) utilized to develop a performance-based assessment tool and rating system for new subdivision plans. The rating system allows planners to assign points and identify failings and changes required to satisfy sustainable growth provisions. It has been used experimentally to evaluate new subdivision applications in New Bern. Results and feedback from stakeholders have been very encouraging and the system will continue to be refined pending its final adoption in the New Bern’s zoning. Apart from few Baroque-inspired plans, the 17th and 18th century North American settlements followed a variety of Medieval-Renaissance adaptations. Gridiron street networks were used as a basis for laying out new towns (Fig. 1a). The towns’ layout was generally predicated on practical needs with open spaces mostly planned for functional imperatives (James and Vance 1990, pp. 251–361). The industrial vigor of the 19th and early 20th century accelerated urban growth and generally induced unemployed and low-wage farmers to the urban factory slums. Cities became polluted with smoke and grime from the belching chimneys, railroads cut through city cores, and waterfronts became cluttered with industrial facilities (Fig. 1c). The suburban movement of middle and upper-middle classes was set in motion. The general sentiment was anti-urban with a tendency to project picturesque pastoral landscapes as a healthy replacement for urban life (Scott and Storper 2014; Mumford 1961; Hall 1996; Southworth and Ben-Joseph 1997). The urban congestion and unhealthy conditions of the 19th century industrial cities have seemingly become a major force in shaping modern planning visions, which aimed to disassemble or enucleate existing urban centers and establish new communities. The Garden city concept as originated in Ebenezer Howard’s milestone publication, “Garden Cities of Tomorrow,” as well as the design features that architect-planners Raymond Unwin and Barry Parker brought to the British new towns of Letchworth (1903) and Welwin (1919) provided the conceptual framework for later suburban development (Ward 1993; Greed 1993; Sies and Silver 1996). In the United States, Stein and Wright developed planned communities such as Radburn, New Jersey, and Sunnyside, New York. They employed super blocks, cul-de-sacs, and curvilinear streets. They also integrated Perry’s neighborhood unit with an elementary school at the community center, large interior gardens, and hierarchical street network. Vehicular traffic was planned to circulate outside the residential blocks on peripheral roads and was very much discouraged to penetrate internal local streets (Fig. 2). Variations of these elements were combined and commodified in the design and development of subsequent residential suburbs (Parsons 1990; Luccarelli 1995; Cullingworth 1997; Bernick and Cervero 1997). With the inception of highway building in New York during the 1920s and the proliferation of intra-and-inter-state highway construction across the United States after the second world war, mono-zoned suburbs served by automobiles became the undisputed mode of development (Figs. 3, 4). Residential, commercial, and employment migration to the suburbs followed the highway expansion and was facilitated by land use regulations, cheap land, and tax policies. The suburbs in North America have grown now from residential, commercial, or industrial enclaves into super-burbs or “edge cities” (Garreau 1991). The urban/suburban development changes outlined above affected big cities and small towns alike. The City of New Bern underwent through the same process; the bulk of new developments took place on the urban periphery and was mostly planned as low-density mono-zoned suburbs. Home architecture and massing went through massive reconfiguration to accommodate the car and modern life amenities. Porch-fitted homes that used to face the street started to give their back to the public realm and most living spaces were oriented to grass lined backyards. Most importantly, car garages were designed to occupy the bulk of home facades, thereby isolating living spaces from the street environment. The following part of the paper contrasts two sets of neighborhoods, the first was built before the 1940s and more or less fits with the ‘porch house’ era while the second group was built in the 1980s and beyond and is designated in this paper as ‘garage house.’ developments. The purpose is to highlight the transition from traditional open-grid street layout and porch-fitted homes to modern suburbs with closed curvilinear street networks and garage-dominated residential developments. Discussions include a preliminary assessment of environmental and physical planning implications of each pattern of development. Three neighborhoods were examined: The Downtown Historic District, Riverside, and Ghent. 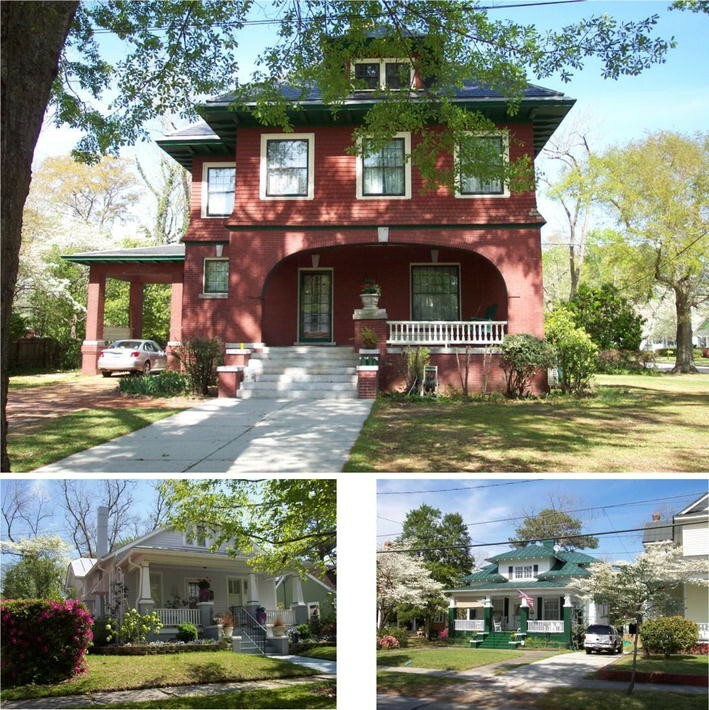 Traditional neighborhoods in New Bern boast pedestrian friendly built environments with different size homes and economic tenures allowing a healthy social mix and providing a model for sustainable urban living. They are characterized by fine grain built forms with active street/building interfaces that potentially enhance social encounters and encourage walkability (Kashef 2009, 2011; Duany and Plater-Zyberk 1992). The presence of landmarks such as churches and civic buildings permeate these traditional districts and help orient pedestrians and enhance the city visual identity (Lynch 1960, 1981). A large number of windows open onto public spaces (eyes on the street) engendering a heightened sense of safety and community (Jacobs 1961). It provides a wide range of live/work and entertainment possibilities within a walkable and well-defined street environments (Fig. 5). It offers homes ranging from cozy cottages and bungalows to three-story, waterfront mansions dating from the 1800s. Many Federal-Georgian-style and Queen Anne homes, some with beautiful porches and gardens, fill the tree-lined streets. In various locations, historic homes have been converted to small shops on ground floors, with living quarters on the second and third floors. Other sections are strictly residential. Shops, restaurants, and a civic theater are within walking distance of residential areas. The river walk provides a pleasant view of the Neuse and Trent rivers that converge downtown. Houses stand very close to the curb with approximately 15-ft. setbacks along some streets. Cars are accommodated through on-street parallel parking, with private driveways occupying side setbacks between homes. The charm of downtown New Bern makes it a national attraction for new residents and visitors, thus contributing to the city’s economic viability and urban vitality. This lies north of the downtown area and features a mix of architectural styles, with two-story bungalows and waterfront homes built between the 1890s and the 1940s. Riverside has been designated as a historic district on the National Register and incorporates a National Cemetery with gravesites dating back to the Civil War (Fig. 6). It was home to the lumber barons in late 1800s, but subsequently declined due to changing economic conditions over the last 30 or 40 years. Riverside is currently undergoing revitalization with various homes beautifully restored to their original nineteenth and early twentieth century splendor. On National Avenue, high-peaked, two-story Victorian structures with wrap-around porches and plenty of shade trees are situated well back from the road. On the cross streets perpendicular to National Avenue and the Neuse River are rows of tidy bungalows. Homes along the waterfront Craven Street are of an entirely different character, with charming brick dwellings on small lots with plenty of trees and meticulous landscaping. A nearby fertilizer factory located on the Neuse River is being demolished to make way for a new residential development. The city and the Historic Preservation Commission have taken measures to restore Riverside to its original function as a mixed-use community with homes and businesses that contribute to the livability and continued success of its neighboring downtown district. Riverside encompasses walkable, well-defined streets and public spaces. Cars are conveniently accommodated on driveways or under carports that do not block the house fronts. Homes address the street with articulated fronts that combine porches and well-defined entrances, thus creating a very rich visual field for residents and pedestrians. Riverside has an open street grid that connects well with the downtown and neighboring areas. It offers residents and visitors a great deal of accessibility and walkability, as well as the potential for social encounters and a sense of belonging to a distinct community. It is located about one mile southwest of downtown New Bern. It became the third historic district in New Bern to be placed on the National Register of Historic Places (Fig. 7). Ghent encompasses approximately 14 city blocks on 70 acres and was developed as a streetcar, suburban residential neighborhood in the early twentieth century. Streetcar tracks of the New Bern-Ghent Railway Company ran down the center of Spencer Avenue from 1913 to 1929. Tracks were subsequently removed and replaced by a median planted with grass and trees. Houses are built on narrow lots and stand close to the street (approximately 25 ft. from the curb). An approximately four-foot sidewalk and a six-to-seven-foot grass strip with mature pecan and oak trees are nicely accommodated within such small setbacks. The pre-1940s Ghent homes are a mix of colonial revival and craftsman-style houses and bungalows with porches that have classical columns or craftsman posts resting on brick piers. Many homes also have outbuildings that are primarily used as car garages or storage buildings, some with finished living areas in their attics. Houses range from one to one-and-a-half to two stories in height and are generally deeper than they are wide, in conformity with the lots on which they stand. Houses built during the late 1940s are mostly one story; many are covered with siding and exhibit the continued influence of the Colonial Revival styles. The 1950s through 1970s produced a small number of colonial revival, brick, ranch-type houses. Ghent homes accommodate cars in driveways or under carports that do not overshadow home fronts. Sidewalks, trees, porches, and rich architectural details contribute to an appealing built form and a unique sense of sociability. Residents can walk to nearby recreational amenities and parks, such as Fort Totten Park, which has a baseball field, and the larger Lawson Creek Park, a popular fishing spot with nature trails and a boat-launching facility. Two constellations of subdivisions are used as representative of newer suburbs in New Bern; the first one includes mid-and-upscale subdivisions; the second constellation encompasses low-to-mid-scale subdivisions in northwest New Bern. Unlike the traditional neighborhoods that offered a wide range of home tenures within a walkable distance, newer suburbs are more or less divided along home values. Accessibility depends largely on the automobile and each subdivision tends to create homogenous social enclave and less articulated built environment. The up-scale development constellation features large homes on large lots, lakefront and golf course properties. Many homes are of contemporary brick designs, and all utilities are underground. These subdivisions are totally designed for the automobile with wide sweeping curvilinear avenues and no sidewalks. Traveling distances in and around these developments can only be measured in miles or automobile trip time. Most internal roads terminate in dead-end cul-de-sacs creating detached enclaves with little internal or external connectivity. Figure 8 illustrates images from Greenbrier, one of New Bern’s upscale residential subdivisions developed during the 1980s. Movement between contiguous subdivisions is channeled through limited access points along major traffic corridors. This creates increased traffic demand on major arteries and leaves vast amounts of pavement inside subdivisions highly underutilized. Walking and biking across subdivision lines is virtually impossible because the entire area inside each subdivision is sliced into private properties with no inter-subdivision pathways. The driving distance between back-to-back properties in two neighboring subdivisions might exceed two or three miles measured across local streets in one subdivision leading to arterial corridors and then back to local streets in the neighboring subdivision. The environmental and social costs for this pattern of development are significant. Some homes were built on environmentally sensitive wetlands; hundreds of acres of wild life habitats and natural corridors were fragmented into private properties. Collectively, these neighborhoods hardly provide a basis for integrated social communities. A multitude of dead end streets that create ineffective traffic patterns, fragmented social enclaves, and diminished social encounters characterize these developments. The second constellation of subdivisions selected for the purpose of this analysis encompasses low-to-mid-scale subdivisions in New Bern (Fig. 9). Houses in the latter subdivisions belong to a category that real estate professionals describe as ‘starter homes.’ They are generally small and built on small lots with attached garages, which are the most defining features of these homes. Garages dominate the house fronts to the extent that main entrances are usually a secondary feature and at times hardly visible from the street. The garage value for most homes has been compromised by its small dimensions and the need for extra storage. Many garages are used as storage rooms and cars are often parked on the driveways or parallel to the street. Most homes are one story and cookie-cutter with very little variation. Identifying homes by numbers could be the most effective way to locate them. Distinct large patches of concrete in front of the homes reduce landscape and create a dreary image for the entire neighborhood. Like their upscale counterparts, these subdivisions are totally designed for the automobile with curvilinear avenues and no or single-sided walkways. Several internal roads terminate in dead-end cul-de-sacs with few access points to surrounding communities. Walking and biking is inhibited by the fragmented design of the street network and sidewalks creating ineffective traffic patterns, isolated social enclaves, and a diminished sense of community. The growth of this pattern of development is limited only by the availability of farm or forest land in the vicinity and the continued supply of infrastructure services. In the absence of a more proactive approach to suburban growth, vast expanses of unsustainable and dull built environments will continue to develop. 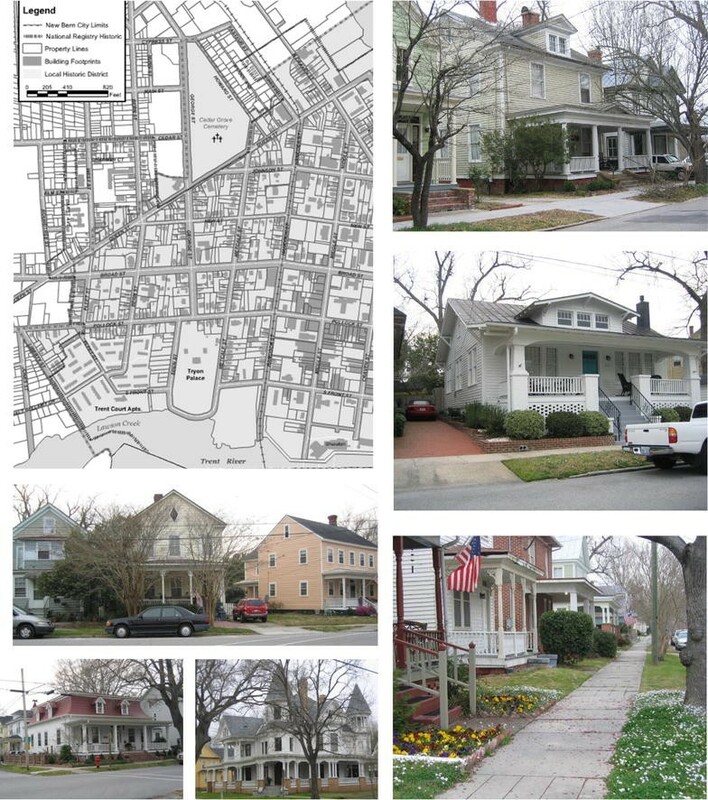 The previous examination of traditional and new subdivisions in the City of New Bern depended largely on five planning and design criteria: accessibility, walkability, community, sustainability, and variety. Design criteria were used somewhat loosely to develop an understanding of the differences between traditional neighborhoods (pre-1940s) and the new subdivisions (post-1980s). In that sense, the criteria were not totally developed a priori before examining New Bern neighborhoods. Understanding and assessment evolved simultaneously in order to develop a pragmatic performance-based approach to guide new subdivision development in New Bern. This process and the urban design criteria presented below were also informed by meetings with various stakeholders that included planners, elected officials, developers, and community representatives in the City of New Bern. Accessibility evaluates both internal and external connectivity of a subdivision, i.e. the physical linkage between different parts of a subdivision as well as the relationship between contiguous subdivisions. As shown earlier, residents of New Bern’s traditional Neighborhoods could move from street to street and one neighborhood to another within an open-grid street network with small size blocks that assured a high level of internal and external accessibility. The grid offered a flexible street network and a clear mental map for motorists, pedestrians and bicyclists. The very high level of accessibility afforded by the grid may not be attainable within a new subdivision context. In addition, the sweeping character of the later curvilinear street design added a picturesque dimension that most people in New Bern seem to appreciate in suburban design and planning. It created a series of blocked or changing vistas and generally enhanced the visual image of neighborhoods (Kashef 2009, 2011; Trancik 1986; Bacon 1976). The looping nature of modern suburban streets also resulted in private and less navigable streets, thus discouraging excessive through traffic and speeding, a quality favored by New Bern residents. Local surveys generally indicated an overwhelming preference for curvilinear streets over straight ones. The latter were consistently described as conducive to speeding, unsafe for neighborhood kids playing or biking. Straight residential subdivision streets were also perceived as visually less attractive than curvilinear ones. Unfortunately, the proliferation of dead-end streets and excessive compartmentalization of modern subdivisions exacerbated accessibility problems and created dysfunctional suburban regions. The result was not only decreased car travel along subdivision streets but also diminished walking and biking opportunities. Pedestrians or cyclists can hardly access modern subdivision different sections without having to backtrack from dead-end streets. The desire to eliminate foreign traffic and limit movement on subdivision streets created highly underutilized internal subdivision streets and unnecessary traffic problems along major arteries. The accessibility criterion advanced by this study is grounded in a balanced understanding of the merits of traditional neighborhood planning and the nuances of modern suburban development practices. Developers commonly cater to prevailing buyer preferences. Three strategies can be used to enhance accessibility while maintaining the curvilinear street pattern. First, street connectors between neighbouring developments can be planned to facilitate low-speed travel across suburban regions. This could potentially reduce congestion along arterial roads and provide more route options when some links are blocked by traffic. Despite concerns about safety and increased car travel along suburban roads, transportation studies indicated that improved connectivity in suburban regions would provide a much needed flexibility of movement, especially for emergency vehicles. Building some redundancy in road networks is also critical to generate a rich modal split between motorized and non-motorized transportation (Crane 2000; Ewing and Cervero 2002). Various traffic calming strategies have been successfully deployed in cities across the US to slow motorized traffic and ensure pedestrians and cyclists’ safety. The use of humps, visible pedestrian crossings, road constrictions (bottle-necks), roundabouts, among other techniques have been invariably noted as effective strategies to slow cars and create safer streets for non-motorized traffic (Burden 2000). Pedestrian and cyclists would be encouraged to travel along low-speed internal suburban roads rather than venturing into high-speed regional transportation corridors. A number of empirical investigations have shown that inter-subdivision connectors increase walking and biking across development boundaries (Crane 2000; Ewing and Cervero 2002; Handy et al. 2004; Alba and Beimborn 2005). Second, small block sizes can enhance accessibility especially for pedestrians and cyclists. A number of statistically-supported studies indicated that smaller blocks (< 1000 ft. long) and higher connectivity indices tend to generate more pedestrian movement (Krizek 2003; Cerin et al. 2007; Frank et al. 2005; Badland et al. 2008; Chin et al. 2007). The ‘connectivity index’ is commonly used to measure the directness and availability of alternative routes between different locations within the road network. It is derived by dividing the number of roadway intersections and nodes (cul-de-sacs included). A higher number indicates a well-connected street system (Ewing 1996). A link in the connectivity index is simply a stretch of road between two nodes. A node ranges from a dead-end cul-de-sac to a three- or-four-way intersection. The more links available in comparison to the number of nodes, the higher the connectivity and the potential of the street network to generate more pedestrian movement (Schmidt and Wells 2005). Third, Hillier’s space syntax (Hillier 1996, 1999, 2002) can be used as a design framework to locate important public functions along subdivision streets. A neighborhood space syntax shows the neighborhood streets as a series of intersecting lines creating a network of links and nodes. Each street or line on the map has a different level of connectivity with the network based on the number of other streets that intersect it. Streets that generate more intersections hold higher value as elements of integration in the network. Important public functions such as parks, shops, playgrounds, etc. tend to catalyze more pedestrian movement and should be located on streets with the highest integration value in the street network (Kashef 2009, 2011). The aim of space syntax is to optimize the spatial allocations and connections between human functions so as to produce the most effective configurations and circulation networks. The assumption is that movement through space is a key organizing element in the social functioning of human settlements. Hillier contends that socioeconomic forces shape the city primarily through the relations between movement and the structural layout of local districts. A mixed-use strategy that brings homes closer to retail cannot generate movement unless shops are selectively located on integrating lines that carry the most movement in relation to surrounding spaces (Hillier 1996). Hillier’s work sparked the development of a large volume of research around the world that used space syntax logic to examine spatial configurations of homes, offices, neighborhoods, cities, metropolitan regions or movement networks of entire countries (Baran et al. 2008; Hillier 1999, 2002; Bafna 2003; Jiang and Claramunt 2002; Nophaket and Fujii 2004; Raford and Ragland 2003; Peponis et al. 2007). The presence of sidewalks is commonly touted as a critical component of walkability in residential developments (Jacobs 1961; Krier 1979; Trancik 1986; Barnette 1995). Systematic observations of various suburban areas with sidewalks in New Bern did not yield sufficient evidence indicating that sidewalks on their own generate pedestrian movement. Furthermore, a host of recent empirical investigations from the public and environmental health fields, pointed to the lack of causality between neighborhood sidewalks and walkability. Most of these studies noted that the presence of sidewalks is positively correlated with walking. They generally explained such associations in terms of the market self-selection process, i.e., people who like walking commonly choose to live in places that support their way of life (Cervero and Duncan 2003; Atkinson et al. 2004; Reed et al. 2006; Oaks et al. 2007; Lovasi et al. 2008; Nagel et al. 2008). This study argues that poor internal and external connectivity diminishes the value of sidewalks to nothing more than cosmetic or landscape elements. Space syntax considerations are also critical to the walkability potential of street networks. This study argues that accessibility is a precondition for walkability, which requires both sidewalks and destinations of interest to pedestrians. Destinations of interest would differ from one subdivision or suburban region to another; some would have parks, natural forests, observation points, or waterfronts and others could offer playgrounds, sports, recreational facilities, shops, or public libraries. In order for destinations of interest to enhance walkability, they should be located along streets with the highest integration value in the network, i.e. streets that carry most of the movement within the network (Hillier 1996, 1999, 2002; Kashef 2011). Sustainability concerns include various environmental, social, and economic aspects (Kashef 2016). Contemporary subdivision planning and design practices seldom consider environmentally sensitive areas; land is generally divided into private lots with streets paving over wetlands, creeks, and other natural features. The loss of natural systems not only endangers wild life habitat but also deprives residents from nature-based recreational and social opportunities. Forests, creeks and wetlands could be effectively integrated with neighborhood sidewalks, bike lanes, and parks to create destinations or points of interest. This may encourage walking and biking as alternative modes of transportation, create possibilities for social interaction and hence more socially sustainable development. Therefore, increasing the percentage of open space in new subdivisions is critical to conserve natural habitat and provide recreational opportunities and public meeting places within suburban communities. Innovative storm water management, such as low impact development (LID), and sustainable building practices also should be encouraged. LID is an integrated approach to environmental protection and restoration that encourages the use of bio-retention cells and swales, as well as permeable pavement surfaces in urban and suburban developments. LID’s goal is to sustain a site’s predevelopment hydrology by adopting design and development practices that infiltrate, filter, store, evaporate, and retain runoff close to its source (Zimmerman et al. 2010; NAHB Research Center 2003). Energy-efficient homes require less heating and cooling than standard homes. Effective passive heating and cooling methods include proper house orientation and window placement, increased insulation values, control of air infiltration, and appropriate landscape techniques that moderate the micro-climate and reduce the temperature differential between indoor and outdoor spaces. The use of green building materials and alternative energy sources, such as solar and photovoltaic, also can enhance the environmental and economic sustainability of residential subdivisions. Sustainable development and building practices with higher densities have the potential to achieve long-term savings for cities in infrastructure management and maintenance. An analysis of the economics of alternative forms of development in the Greater Toronto Area has revealed significant economic variations among the extremes of urban sprawl and city-centered developments (SOLEC 1996). The study states that to accommodate the growth forecast of two million persons over the next 25 years, the status quo urban sprawl will cast an estimated $90 billion in supporting capital investment for new municipal infrastructure. The more compact, re-urbanized option would reduce those municipal expenditures by as much as $16 billion for the infrastructure capital and as much as $4 billion for operating and maintenance over that 25-year period. When external costs, such as health care and policing, are added, compact developments will lead to a net saving of about $1 billion per year. The study concluded that prevailing urban sprawl patterns generally cost taxpayers 25% a year more than a medium-density development. Of particular significance to residential sustainability debates is Ian McHarg’s ‘design with nature’ approach which is premised on identifying the ecological characteristic of urban growth regions and ‘concentrating’ development in the least environmentally sensitive tracts (McHarg 1969). Arendt (1996) subsequently developed McHarg’s approach into in a theory of conservation design, sometimes called ‘cluster development.’ He called for conserving the ecological attributes of development sites by clustering buildings and reducing lot sizes, while maintaining the overall density specified by local ordinances. The overarching objective of clustering homes is to reduce the ecological footprint of the human habitat and provide a breathing space for other species, thus enriching biodiversity (Fig. 10). This criterion deals with ways to enrich the image of subdivisions including buildings, streets, sidewalks, and public meeting places. The New Urbanists expressed a renewed interest in traditional building practices. They contended that attention to architectural details and visual stimuli can encourage civic engagement (Duany and Plater-Zyberk 1991; Katz 1994; Dutton 2001). In this respect, traditional neighborhoods in New Bern juxtapose a successful combination of elements that create a variegated and attractive built environment. Most significant is the variety in home designs, sizes, roof slopes, colors and architectural details that make each home or group of homes stand out and present a unique image along the street or curb line. Sidewalks are well-designed with plant strips and trees that define the sidewalk space and buffer pedestrians from cars parked parallel to the street. The chance to change directions and see other streets and buildings due to small size blocks and seamless connectivity with neighboring areas enhances the experiential quality of public space. On the other hand, typical suburban subdivisions display standardized built forms. They generally adopt a cookie-cutter approach that produces less articulated built environments; streets function as conduits for car traffic with little or no social functions. This trend should be reversed; subdivision ordinances should be revised to encourage architectural variety. Sense of community is a value that can hardly be quantified or legislated in subdivision ordinances. It can be cultivated by providing certain features and social possibilities that engender positive interaction among residents. Place attachment is another term that is commonly used in conjunction with sense of community. It is a complex and equally pertinent construct that figured in most design and planning literature as both a by-product of and contributor to the sentiment of community. Place attachment is often described as a “positive affective relationship between people and place” that occurs because of people’s satisfaction and identification with a specific place (Bonnes and Secchiaroli 1995). Identification with a place results in emotional connections with its physical attributes that people often associate with social events. Place and associated emotions and events become inseparable or interchangeable in people’s minds (Giuliani and Feldman 1993). The meaning of place here encompasses built environments as well as natural and cultural landscapes (Hidalgo and Hernandez 2001; Herzog et al. 2003). Designers have generally maintained that certain spatial configurations, built forms, and design elements can play a significant role in promoting sense of community, safety, and place attachment (Kashef 2008). The most significant design theme arising from the design and planning literature and potentially affecting neighborhood sociability is the interface between the private and public realms (Kelbaugh 1997; Jacobs 1961; Alexander 1965, Alexander 1977; Duany and Plater-Zyberk 1992). It is essentially about the articulation of the outer skin of buildings or homes and disposition of buildings in space. Various studies indicate that increasing the interface between private and public realms tends to heighten the level of activity around the edges of buildings (Newman 1972; Whyte 1980; Bentley et al. 1985; Bentley 1999; Moughtin et al. 2003; Duany et al. 2003; Neal 2003). From a residential design perspective, elements that contribute to increased private/public interface include windows of active living spaces, transitional spaces such as entryways or porches, as well as the availability and distribution of common spaces. As long as home privacy is maintained, the presence of such elements creates opportunities for walking and social interaction among inhabitants (Duany and Plater-Zyberk 1992). The interaction referenced here can be characterized as passive or active. The passive social interaction falls under a category that Bill Hillier calls ‘social or spatial co-presence.’ Hillier contends that co-presence and therefore co-awareness amongst the individuals living in and passing by an area can be considered a raw material for social interaction. Whilst co-present individuals are not a community and may not know or acknowledge each other, they in fact form a social resource for communal behavior. Co-presence is a very important psychological resource in and of itself and can be brought about by design (Hillier 1996, pp. 129–214). Jane Jacobs’s ‘eyes on the street’ and Newman’s ‘defensible space’ have earlier noted the significance of home windows and visible entrance doors in providing surveillance and self-policing of public spaces (Jacobs 1961; Newman 1972). Active interaction is commonly perceived as a by-product of increasing the pattern of ‘probabilistic interfaces,’ a heightened sense of co-awareness or co-presence, leading to overt social acknowledgment (Hillier 1996, pp. 129–214). Transitional spaces such as home porches provide a setting for conversation, a kind of ‘Shakespearean’ theatrical platform for social ‘play.’ Porches project the human presence within the house to passersby, creating a sense of ‘plot’; a voluntary and potentially entertaining social exchange (Fig. 11). The availability of the home porch is significant whether a conversational exchange takes place or not. The porch acts as a precondition or a ‘stage’ for a social play that otherwise would not have been possible. It “creates the illusion of a whole already in place but which becomes real only as individuals act on their perceptions of it” (Hastrup 2004; Kashef 2009). Various environmental sociology studies showed statistical evidence that design and spatial allocation of homes within residential blocks can have an impact on residents’ social relations and interactions (Gans 1962; Rapoport 1977). They asserted that facilitating people interaction by proper arrangement of private and shared public spaces enhances social contact and group/place attachment (Williams 2005; Talen 1999; Fleming et al. 1985). Newman indicated that sense of safety in residential areas can be improved by properly locating doors, windows and common spaces. He associated the heightened sense of safety with the economic and social viability of residential space and communal practices contributing to individuals’ well-being (Newman 1972). The proposed performance-based rating system for subdivision applications in New Bern stems from a balanced understanding of the planning and design criteria discussed above. These criteria are not mutually exclusive. For example, improved accessibility would encourage walkability and enhance sustainability; delightful physical environments would promote walkability and encourage residents to patronize public spaces, which create possibilities for social interaction and hence increased sense of community. The criteria form the basis of the proposed design standards that New Bern developers would comply with to get development permits. The design standards are incorporated into an objective, performance-based assessment tool that allows planning staff in New Bern to assign points and identify failings and changes required to satisfy sustainable growth provisions. Ideally, developers should work out subdivision plans that reflect a comprehensive consideration of the five criteria. A more realistic expectation is that development plans would manifest differentiated emphases on these criteria. Some might score higher on architectural variety and open spaces, but lower on accessibility; others would satisfy accessibility and walkability provisions, but fall short of addressing energy-efficiency and conservation requirements. The overlap and built-in redundancy between the criteria ensures that successful developments would encompass a sufficiently reasonable mix of sustainable growth requirements. One of the major objectives of the proposed system is to provide a level of flexibility that allows developers to work out sustainable subdivision plans while achieving their economic objectives. This has been an integral consideration in devising pragmatic and potentially implementable design standards. Another important consideration is that development locations, site characteristics, economics and target market specifics, etc. would influence developers’ selective emphasis on some criteria versus others to satisfy the passing score. Each of the five planning and design criteria was deemed equally important. Hence, the total weight of 100 points was divided equally among the criteria giving each 20 points on the rating system. The passing score was generated by methodical reviews of various subdivision applications submitted over a period of 2 years to the City of New Bern. Subdivisions that satisfied the bulk of the planning and design criteria scored 70 points or more on the 100-point rating system. The subdivision rating system has been used experimentally to evaluate new subdivision applications in New Bern. Results and feedback from stakeholders have been very encouraging and the system will continue to be refined pending its final adoption in New Bern’s zoning ordinance. A preliminary checklist of planning and design provisions and corresponding scoring weights are presented below. Connectivity with neighboring subdivisions (street and/or sidewalk connectors) Road connectors that provide access for cars, pedestrians, and cyclists qualify for 10 pts. Walking and biking connectors qualify for only 5 pts. Subdivisions that are surrounded from three sides by wetlands, conservation areas, lakes and other natural features that preclude the possibility of connectors with neighboring subdivision are exempt from this requirement. Connectivity of subdivision blocks, connectors between cul-de-sac streets. Road connectors that provide access for cars, pedestrians, and cyclists qualify for 5 pts. Walking and biking Connectors qualify for only 3 pts. Subdivisions with a narrow frontage and a single access road to building lots are exempt from this requirement. Flexibility of movement; small-size blocks, 600 ft. or less qualify for 5 pts. Subdivisions with a narrow frontage and a single access road to building lots are exempt from this requirement. Sidewalks on both sides of a subdivision street qualify for 10 pts. Sidewalks on one side of a subdivision street qualify for only 5 pts. Open spaces and destinations of interest (excluding home fronts and backyards). Walking and bilking trails, lakes and promenades, parks, landscaped common areas, observation points, etc. 5% of subdivision area is a minimum requirement and qualifies for 0 pts., 10% qualifies for 5 pts., and 15% or more qualifies for 10 pts. Public amenities such as picnic shelters, park gazebos, playgrounds, sports fields, etc. qualify for 5 pts. These amenities are physically developed with subdivisions or an exchange value paid to help support and build public recreational facilities throughout the city. Porches mandated by subdivision covenants qualify for 5 pts. 40% or more of homes in a proposed subdivision must be provided with porches to qualify for 5 pts. Covenants must be attached to subdivision sections and/or building lots designated for porch homes. Entrances and active windows facing the street; garages and storage rooms are not considered active spaces. Active spaces include living rooms, bedrooms, kitchen, dining, etc. Home entrance and windows of one active space must face the street to qualify for 5 pts. This requirements must be mandated by subdivision covenants to qualify for the points. Concealed garage doors; side, rear, or back alleyway garages qualify for 5 pts. Garage doors facing the street but recessed backward 10 ft. or more qualify for 3 pts. Adherence to low impact development (LID) standards as defined by US EPA Office of Water 104b (3) Program (lowimpactdevelopment.org) or subdivision conservation standards qualifies for 5 pts. Subdivision conservation designs and protection of environmentally sensitive wetlands, ponds, forests, creeks, etc. qualify for 10 pts. Must provide opportunities for residents to enjoy natural resources and integrate sidewalks with forest trails or lake promenades. Energy-efficient and green building practices mandated by covenants qualify for 5 pts. Lot width variety; a size variation index of 30% or more for lot width every 600 ft. along the same road qualifies for 10 pts. Architectural variety; variety among contiguous properties mandated by covenants qualifies for 5 pts. This includes, but is not limited to height, roof slope and façade, and window treatments. Continuous planting strips and trees qualify for 5 pts. The planning and design assessment tool proposed by this study is part of a comprehensive process aimed at drafting a regulatory framework that encourages best practices in residential subdivision development. 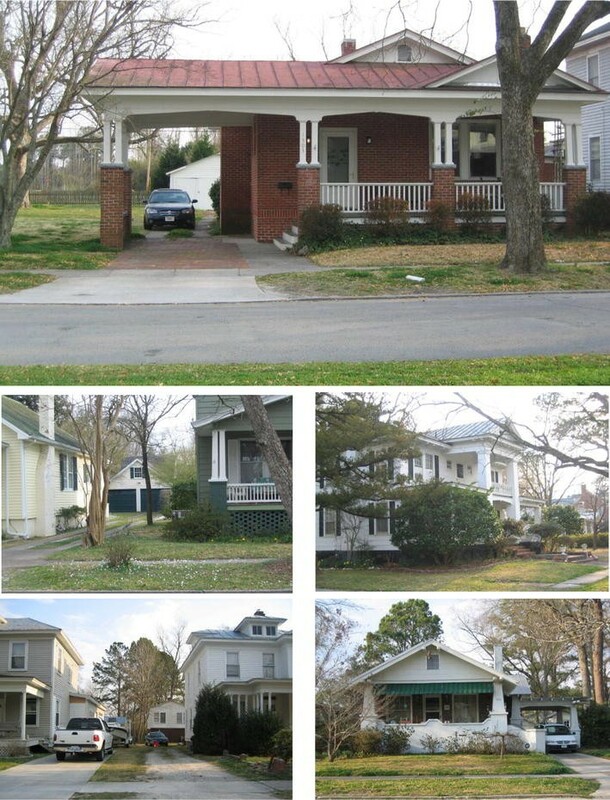 The comparison of traditional neighborhoods and new subdivisions in New Bern highlighted the underlying characteristics of livable city spaces and neighborhoods. Issues considered in this comparative analysis included intra- and- inter-neighborhood connectivity, walkability, possibilities for public social discourse, sustainability and architectural variety. Discussions with planners, elected officials, developers, and community representatives in the City of New Bern have been crucial to developing the planning and design criteria used as a basis to evaluate subdivision applications. The proposed subdivision assessment tool is performance-based and allows developers to work out their plans in different ways and configurations so as to achieve their economic objectives, yet build livable and sustainable neighborhoods. The score card shown below (Table 1) has been designed to allow planners and developers conduct preliminary assessments of subdivision plans. It has also been used as a planning and design checklist to guide the conversation with developers, city officials, and community groups. The score card has been presented with a multitude of images from New Bern and other cities in order to generate a robust understanding and a consensus on the proposed system. Developers have initially raised some concerns regarding the feasibility of achieving the proposed 70 pts. Some have also proposed a lower passing score so that they can strike a balance between meeting the requirements and development economics. Few of them debated whether such improvements would satisfy consumer preference for bigger lots, deeper setbacks, and multiple car garages. Meetings and discussions have been vital to revise and improve some of the requirements and also highlight the flexibility imbedded in the proposed performance-based subdivision regulation tool. Planning staff at the City of New Bern have demonstrated various scenarios where development locations, site characteristics, economics and target market specifics can be accommodated while satisfying the passing score. The built-in redundancy and overlap between some criteria would ensure that passing developments would help the City of New Bern change the growth trajectory from standardized and fragmented subdivisions to more integrated and sustainable urban and suburban regions. Over 30 years of professional practice, public service, and academic experiences. Practiced architecture, urban planning and project management and led the planning, design and development of large scale urban regeneration projects. Advised several cities in North America in drafting performance zoning and urban design guidelines. Combined Architectural and planning education and practice. This research has been facilitated in part by the information shared by Mr. Michael W. Avery, AICP, Former Planning Director at the City of New Bern and Mr. Bernard George, AICP, CZO, Planning Division Manager, City of New Bern, North Carolina, USA.